Jim’s Martinsville Musings – Welcome to Late Model Digest! Our latest mega-huge short-track show was the ValleyStar Credit Union 300 at Martinsville Speedway. I haven’t missed the biggest event in Late Model Stock Car racing in 14 years, but this season’s edition was probably the most frustrating. Pretty much everyone in attendance has something they’d want to change or fix about this year’s race. The remnants of Hurricane Florence wiped away the scheduled test day Sept. 20, so the track and NASCAR officials scheduled the open practice for the Thursday before the race. But officials and racers can’t do anything about weather. No complaints from me, especially since I never go to practice day anyway. Technical inspection was an issue this year, especially when concerning the popular Harrington Enforcer engines. At first NASCAR was going to add weight to the cars with Enforcers and remove their spacer plates, removing a perceived advantage for those powerplants. The spacer plates were allowed back onto them after the practice day, which was also affected by rain. It’s hard to imagine a change like that being implemented during a race weekend, but NASCAR’s hands were tied here. Plus as long as there will be motorsports, there will be parties on either side of a tech issue lobbying for advantages. Let’s move on. Anytime there’s a wreckfest on a short track, people will wonder what has gotten into the drivers – at the front, middle or back of the field – that is making them run into each other much more frequently than they usually do. The answer is clear here: it’s Martinsville. The winner receives a $25,000 prize and a coveted grandfather clock. Sure, you want the drivers to calm down, but it probably won’t happen with anything short of a Rex Robbins-called timeout from the ASA days in the 1980s. Here’s my beef with the race. NASCAR instituted a maximum of three overtime finishes for the event. Anywhere else in NASCAR touring racing, they’ll go as many green-white-checkereds as needed. There’s an overtime line at Martinsville, as in any other track on the NASCAR national schedule. In a Monster Energy Cup, Xfinity or Camping World Truck race, if the leader doesn’t get to that line and see the white flag before the caution comes out, the race isn’t over, and they’ll line up for another restart and two-lap sprint. Under the rules of this race, if a caution came after the third overtime attempt, they’d go back to the line at the last completed lap to determine the winner and other positions. That’s what happened, and the decision went in favor of C.E. Falk and against Corey Heim. That wasn’t the problem, but the rule was. 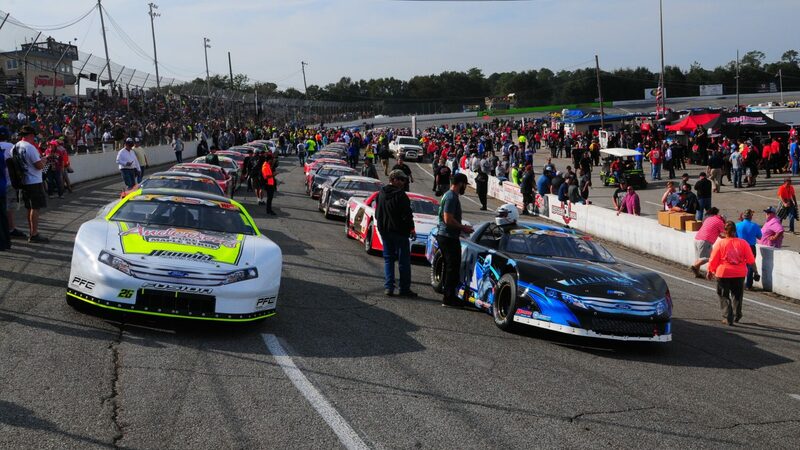 This was the headline event of the season for perimeter-framed Late Models, the prevailing short track automobile for tracks in Virginia and the Carolinas, plus Kingsport, Tenn. It deserves to be decided on the track and not via the rulebook. Falk, Heim and the others should have lined up for another green-white-checkered attempt – hopefully just one but it might have been more. Meanwhile, I was really impressed by the positive attitude of Peyton Sellers, who finished fifth after taking a couple of overtime attempts from the front row in pursuit of his first Martinsville triumph. Sure, he had 5,000 reasons to smile, because he topped the Virginia Triple Crown points and earned five grand, but the damage incurred by collisions with Josh Berry, Bubba Pollard and Layne Riggs might cost his family team and sponsors that much or more. Maybe I’m a little biased in wishing well for Sellers, but there’s a reason. Three years ago at Motor Mile Speedway, Porsha and I found a flat tire on our car in the parking lot, and we were on an inclined area full of gravel. That’s not exactly the best situation to use a standard-issue Honda jack. Did I mention it was 1:15 a.m.? Well, Sellers and a couple of his crew members came out to the parking lot and used their professional Brunnhoelzl jack, and with that we had our tire changed in three minutes. Racing is full of personal stories like this. Until the next time … enjoy short-track racing, and thanks for your support of Late Model Digest!